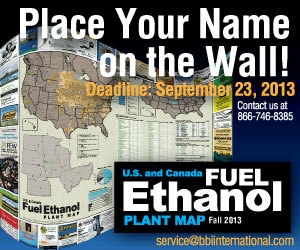 The U.S. EPA has finalized the 2013 volume requirements for the renewable fuel standard (RFS). The final 2013 overall volumes and standards require 16.55 billion gallons of renewable fuels to be blended into the U.S. fuel supply. Dakota Spirit breaks ground on 65 MMgy corn-ethanol plant in N.D.
Groundbreaking ceremonies for the first corn-ethanol plant to begin construction in five years took place Friday, Aug. 9. The 65 MMgy Dakota Spirit AgEnergy LLC is being co-located next to Great River Energy's Spiritwood Station in Spiritwood, N.D.
Two Minnesota ethanol plants located less than 100 miles apart now have a strong connection. Granite Falls Energy LLC recently acquired a majority interest in Heron Lake BioEnergy LLC and will share three management positions between the facilities. Praj Industries Ltd. has broken ground on a cellulosic ethanol demonstration plant with the the capacity to process 100 dry metric tons of feedstock per day. The facility will test a variety of feedstocks, including corn stover, cobs and bagasse. Genscape LandViewer team has released its corn supply predictions to clients, putting the corn supply to at least 12.6 billion bushels. The LandViewer team is not ready to commit to the 14 billion bushels anticipated by the USDA. The results of a study on antibiotic residues in distillers grains (DG) published in the Journal of Animal Science suggest that antibiotic residues in DG are inactivated during the production process or are present in sublethal concentrations. Gevo Inc. has released financial results for the second quarter of 2013, reporting revenues of $1.9 million. During a call to discuss the results, Gevo CEO Patrick Gruber provided an update of progress at the company's Luverne, Minn., facility. The U.S. DOE's National Renewable Energy Laboratory is working with Ecopetrol, the largest oil company in Colombia, to process the residue from sugar cane and palm oil harvesting into fuel ethanol for blending with gasoline. The U.S. EPA has updated its RE-Powering Mapping and Screening Tool, which is part of the RE-Powering America's Land Initiative. The tool lists thousands of potential sites for bioenergy and biofuels on contaminated land, landfill and mine sites. A new analysis published by Iowa State University professors Bruce Babcock and Sebastien Pouliot and titled asserts that more effective pricing of E85 could help the U.S. overcome the looming E10 blend wall. The ethanol group at The Andersons reported recording operating income of $10.6 million in the second quarter on revenues of $222 million. This compares to an operating loss of $2.1 million during the same period of 2012 on revenues of $168 million. Archer Daniels Midland Co. reported net earnings of $223 million, or 34 cents per share, for the second quarter, which ended June 30. Operating profit of the company's bioproducts segment, which includes ethanol, went up $158 million to $97 million. EZ Stop of Mapleton, Iowa, will be offering E15 to 2001 and newer vehicles this fall. In order to offer E15, a retailer must register with the U.S. EPA. The Iowa Renewable Fuels Association is assisting EZ Stop in the registration process. The U.K. Department for Transport has published statistics on its renewable transport fuel obligation (RTFO) for the most recent compliance year, which spanned from April 15, 202 through April 14, 2013. The U.S. Energy Information Administration has published the August issue of its Short-Term Energy Outlook report, forecasting that U.S. ethanol production will average 920,000 barrels per day in 2014. The Andersons Inc. announced it has entered into an agreement to acquire Mile Rail LLC, a railcar repair and cleaning provider headquartered in Kansas City, Mo. The company has three satellite locations in Nebraska, Kansas and Indiana. The U.K. Department for Transport recently announced it will provide capital funding to support the development of one or more demonstration-scale advanced biofuel plants. The projects will be selected through a competitive process. ICM Inc. is pleased to announce the issuance of Canadian Patent No. 2,799,409 for its Advanced Oil Separation system. The Canadian AOS patent expires 20 years from an international filing date, expiring on May 11, 2031.